Our in-house design team's inspiration for this sideboard came from wanting to create a piece that would literally go with any interior but is by no means generic, and the design of the Lexi was the stunning result! This modern sideboard combines style, function and form that is sure to add a refined and elegant look to any home. 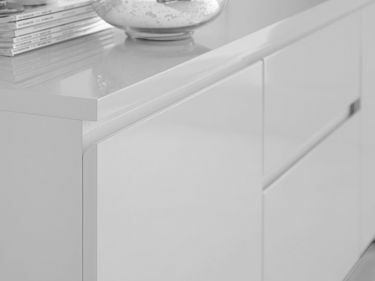 The Lexi White Gloss Sideboard measures 170cm in length, with lots of storage in the form of two cupboards with shelves, and two drawers. This offers plenty of storage space to store a variety of items. 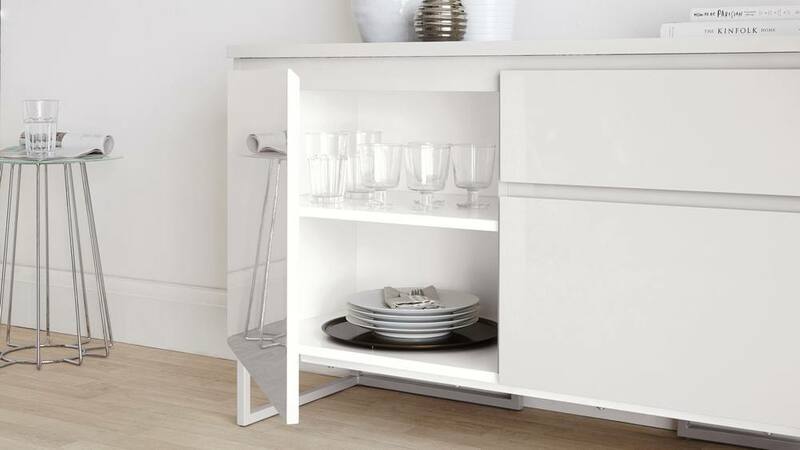 The shelves within the unit can be adjusted so that you can change the height depending on what you choose to store and hide away. 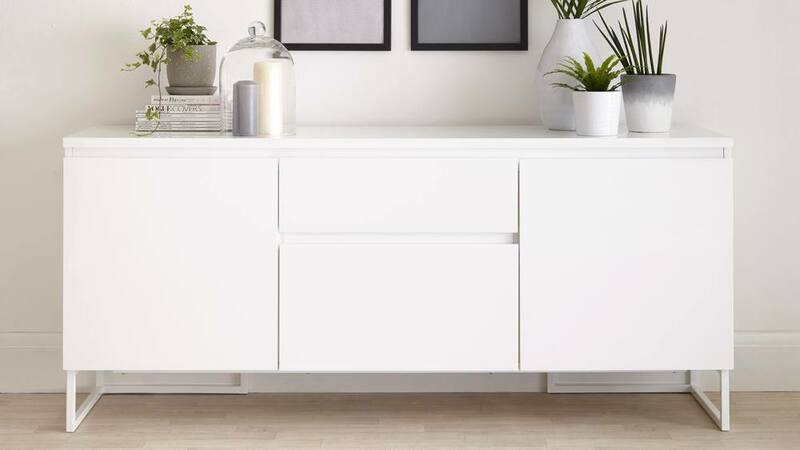 The bottom drawer is slightly deeper than the top one so you have space to store those slightly larger, more bulky items, making this sideboard incredibly versatile. 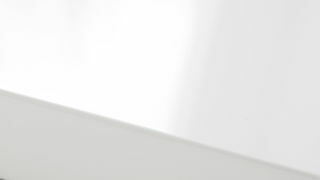 We have used high spec superior quality hardware on the Lexi Sideboards and these are the differences that you can really feel. 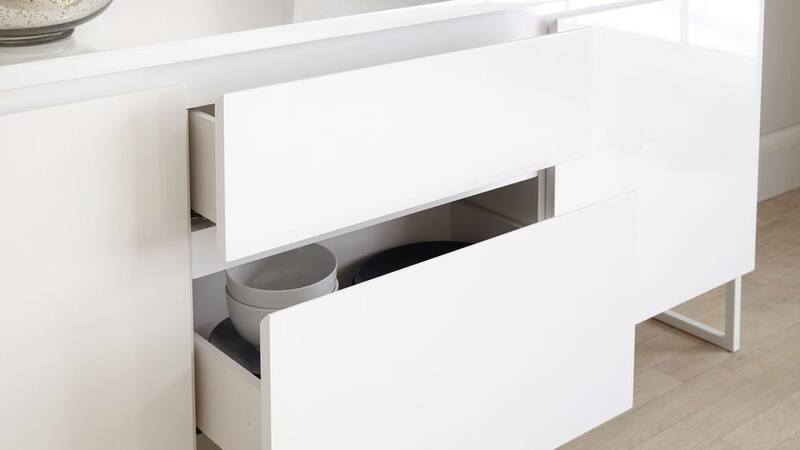 This includes the use of soft close hinges and drawer runners for a smooth feel and no danger of trapping little fingers. 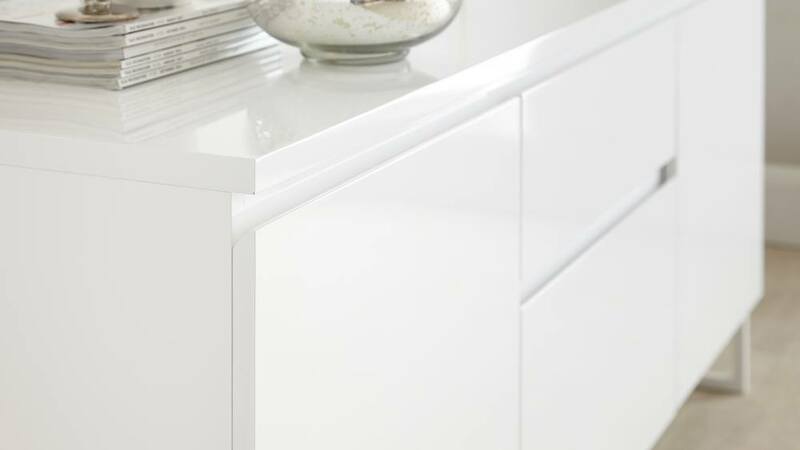 In line with the simple modern design, we've added a simple channel with a 45 degree angle to all the doors and drawers. This makes them easy to use and takes away the visual full of hardware. 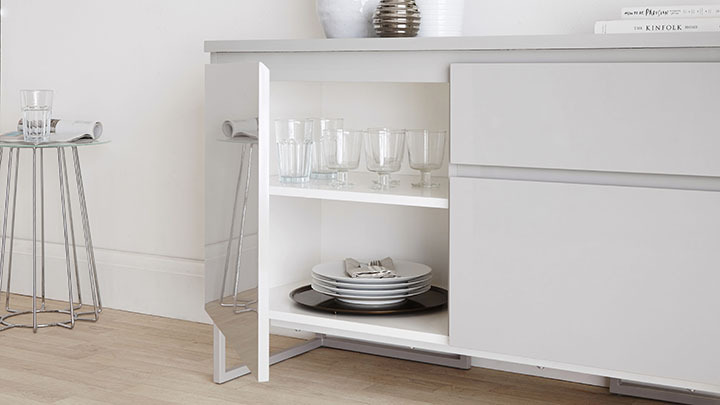 The Lexi sideboard comes almost fully assembled, you just have to attach the legs. This means that there's no messing about with flat pack instructions and the Lexi is ready to start admiring! 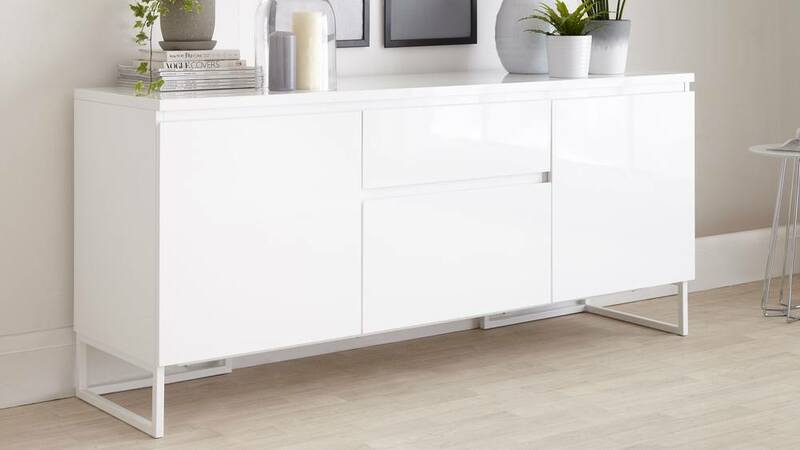 Clean lines and contemporary coordination, the Lexi White Gloss Sideboard is the perfect styling and storage piece for modern family homes. We also have the Lexi Grey Gloss Sideboard if you like the shape of the Lexi but are after a slightly warmer looking finish. Delivery: Delivered to you 11 weeks approx. 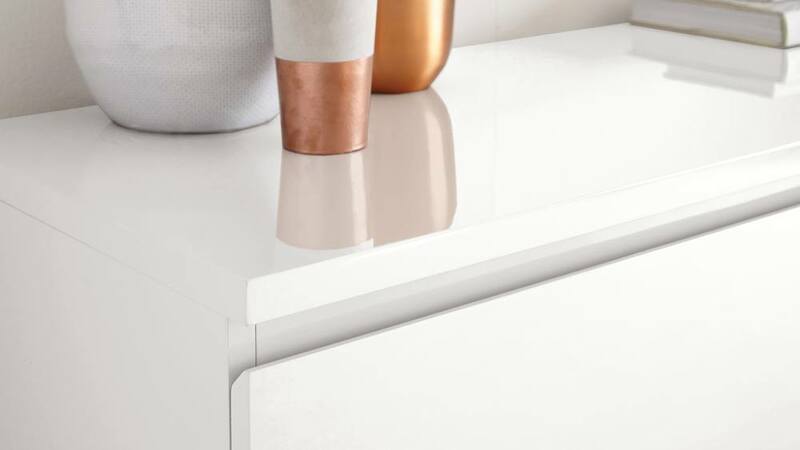 This elegant compact sideboard is so much more than a storage piece, with its soft closures and intricate edge detailing providing a place to display or store a variety of items to keep your room looking neat and tidy. The Lexi sideboard not only looks the part, but it will also add a feel of quality and premium luxury to your home.